Data is from the SotonMet WAP feed (or BrambleMet WAP when SotonMet is not working). Long term current and historic rainfall graphs. 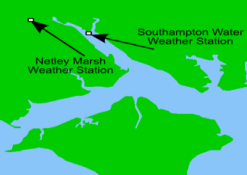 The Netley Marsh data is obtained from a number of 1-wire weather sensors in our garden. You can find out more information about the hardware and w1retap software used (Linux, 1-wire, postgresql), on the technical description page. There are also some pictures of the sensors and Daria's greenhouse in the image gallery. Our garden is surrounded by trees, therefore we do not have an anemometer; it is convenient to use the SotonMet WAP feed for wind information. In the rainfall table, the Avg. Month mm column is the expected historic rainfall for the month, taken from the Weather Channel climate statistics.